Turkey snubs Israel, makes gesture to Hamas, with flotilla of “siege-breaking” ships. While residents of Gaza have access to the sea, the Israel Navy prevents travel by sea between Gaza and surrounding countries, in an attempt to prevent weapons smuggling. Gaza terrorists have previously used incoming ships to smuggle arms, and have used the sea to transport bombs to the coast of southern Israel. The ships are sponsored by the Turkish group IHH (Insani Yardim Vakfi), which receives government support. 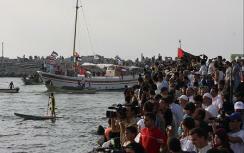 IHH also held a massive fundraiser to collect the more than $2 million it spent on the boats. The IHH group will be joined by ships from Britain, Greece, and Ireland in the attempt to break Israel's control at sea. The delegation will include members of parliament and journalists, organizers said. The flotilla follows previous such missions in challenging Israel's ban on international travel to and from Gaza, as part of a campaign dubbed “Free Gaza” by its organizers. The latest group of ships will bring several hundred passengers and 5,000 tons of cargo, including humanitarian supplies, cement, and building materials. The decision to bring cement is another challenge to Israeli policy in Gaza. Israel allows humanitarian aid through its border with Gaza, but allows cement and metal pipes to enter the area only for use in specific projects, in coordination with international aid groups. Israeli defense experts worry that if Hamas were allowed to import cement and pipes freely, it would use them to build bunkers and rockets as it has done in the past. IHH organizers said they see several possible outcomes to their venture: either Israel will allow them to land in Gaza, giving them a PR victory, or Israel will prevent them from reaching Gaza by stopping the ships or seizing their cargo, thus subjecting itself to international condemnation. Another scenario is that Israel's navy might fire on the ships, which could possibly be considered a declaration of war on the ships' countries. Ties between Israel and Turkey, once friendly, have been strained since early 2009, when Turkish Prime Minister Recep Tayyip Erdogan and other senior leaders harshly condemned Israel for its counterterrorism operations in Gaza. Erdogan publicly snubbed President Shimon Peres, Turkey later held a joint military exercise with Syria, and cancelled Israel's participation in a scheduled military exercise. In 2010, Turkish television aired a virulently anti-Israel drama that depicts Israel kidnapping babies and murdering innocent Arabs.